Truth be told, there aren't a lot of iPad games that grab me in the can't-work-can't-sleep-I've-just-gotta-play-it kinda way. But I'm amazed I've gotten anything done since World of Goo came into my life this week. World of Goo, iPad, $5. World of Goo was not born on the iPad. It started as an immensely successful WiiWare game—garnering more or less unanimous praise—and is available for PCs and Macs. 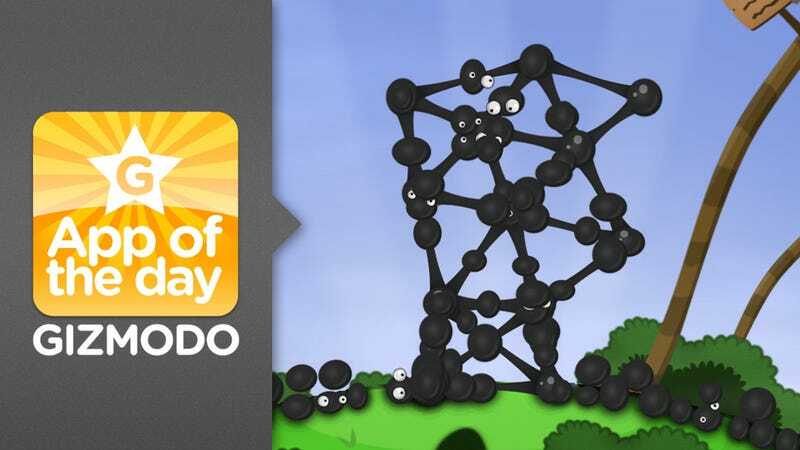 But the game, a pure physics-based treat in which you build structures out of little living goo balls, is right at home on the tablet; using your finger to sling goos into place as you make your way through the various levels, discovering new and strangely behaving species of goo, is immensely satisfying. Anyone with an iPad. Really, anyone. It's the full package: beautiful graphics, awesome soundtrack, and most of all a really easy to learn, endlessly satisfying game dynamic. If it consumed my life this week a little less completely.